All UK beds must have a fire retardant layer or component, whether it is contained within the foam mix, sprayed on afterwards, mixed via graphite in Latex or a fire retardant cover i.e. wool or synthetic. It’s important that as a consumer you are aware of the regulations around fire retardants. This article should help you understand the difference and requirements for mattresses. This is to comply with British regulations (BS 5852: 1982 Part II & BS 7177). Mattresses from other countries may have different compliance levels or in some cases no compliance. It is important when you purchase a mattress you are aware of this. 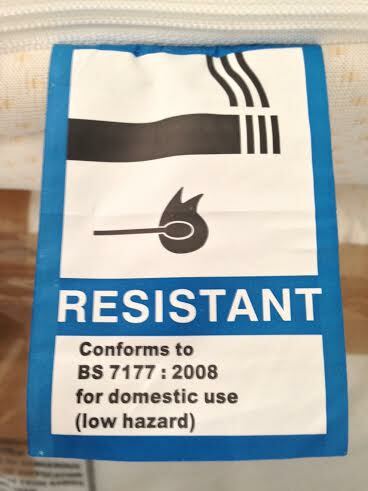 In the case of mattress covers, they must be compliant with BS 7177 low hazard for domestic use. This is to ensure that the covers of the mattresses are fire resistant to a cigarette or smoulder test. A cigarette is put along the crevice of a test rig and allowed to burn for its entire length. If no flaming or progressive smouldering is observed on both cover and interior material, the test is recorded as ‘no ignition’ and the material passes the test successfully. A burner is lit, held along the crevice of a test rig for 20 seconds and then removed. If no flaming or progressive smouldering is observed on both cover and interior material, the test is recorded as ‘no ignition’ and the material passes the test successfully. A more intensive test is used on the fillings and components of mattresses, usually known as the crib test. Our foams and fillings used have been tested to a medium hazard under this test. A crib is composed of small wooden planks, about 5″ in diameter, which are then glued together. Lint is attached to the bottom of the crib. After adding propane-diol, the crib is placed on the test rig and ignited with a lit match. If no flaming or progressive smouldering is observed on both cover and interior material, the test is recorded as no ignition and the material passes the test successfully. An example of a legitimate FR compliance label is shown below for Source 1 and 2. Please be aware of foreign counterfeit labels which don’t follow this format. All our Memory foam materials are manufactured with a fire retardant compound included in the foam composition. These have been certified as FR compliant, tested and approved to the crib test. The mattress covers have passed the BS 7177 source 0 and 1 standards. All our hybrid foams are manufactured also with a fire retardant compound within the foams composition. These have been tested and passed as FR compliant, tested and approved to the crib test. The mattress covers have passed the BS 7177 source 0 and 1 standards. We use a thin slice, 1cm each side, of graphite FR Latex to ensure the mattress complies with regulations under BS 5852 to the crib test carried out by FIRA. This will only have a very negligible feel to the texture of the raw uncovered mattress, this shouldn’t effect the superior quality of the latex mattress but, as always, we are fully transparent. 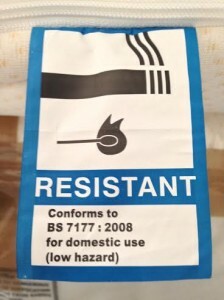 The mattress covers have passed the BS 7177 source 0 and 1 standards. Memory foam and latex mattresses bought from other countries may not have this FR layer which you must consider whether you want to take that risk. Always ask when buying imported mattresses which standards they have been tested to for your own peace of mind. Update 2014: There have been a number of recent press articles and documentaries on the Fire retardant compliance of mattresses and sofas in the UK. Most notable the recent BBC ‘Fake Britain’ documentary ‘Furniture inferno’ demonstrated some startling results. Major sofa and bed retailers such as SCS, Tesco, Argos and Amazon sold mattresses to the public which were tested under the above compliance, along with source 5 the burning crib test. They all failed the tests and were deemed non-FR compliant to be sold in the UK. 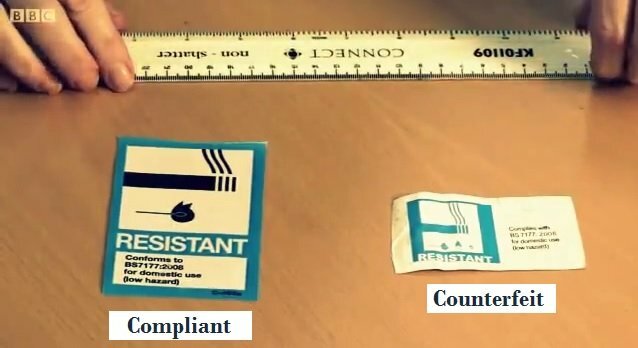 Fake compliance labels have also been investigated as a number of retailers and suppliers are proving non-compliant furniture with counterfeit FR labels. When in doubt FIRA (Furniture Industry Research Association) have plenty of guidelines if you are uncertain.